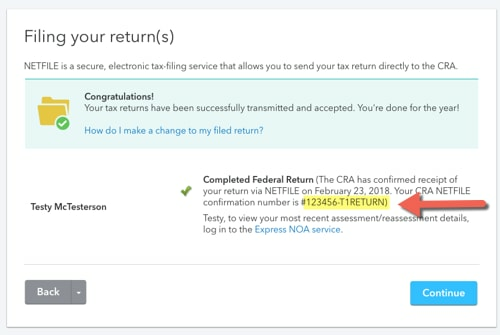 When you've successfully filed your return using the CRA’s NETFILE service, TurboTax will display a confirmation number to indicate that your return was filed and received by CRA. You can see this confirmation number in TurboTax any time after you file. Important: Your TurboTax payment transaction number (e.g. TXXXXXXX) is NOT your NETFILE confirmation number. If you're not already signed in to TurboTax, sign in to your online TurboTax account and select the View button beside your return to open it. From the navigation menu on the left, select File, then select CRA Online Mail. Note: The menu is up top in TurboTax for tax year 2017 and 2016. On the Do you want to register for CRA's online mail? step, select Continue. On the Filing your returns step, locate your NETFILE confirmation number. If you’re in Forms view, select EasyStep at the top of your screen. Once in EasyStep, on the left-side menu, select File and then select Electronic Filing (NETFILE). The return(s) you’ve filed will be listed with a green checkmark, the confirmation number, and the date they were filed. If you haven't filed yet, your return (and that of your spouse, if applicable) will be listed, but without a checkmark, date, or confirmation number.